Got a fair amount done over the Thanksgiving holidays. Here’s the sides with kerfed lining installed, being sanded on our infinite-radius dish board. None of these wimpy fifteen- or twenty-foot radii for us. 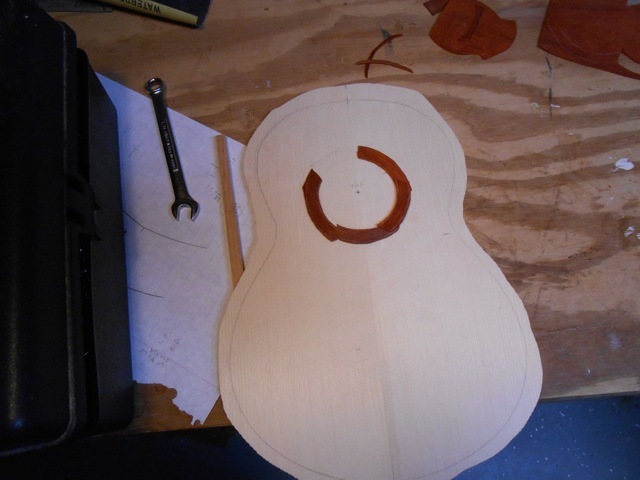 Back, with braces installed but not yet carved. 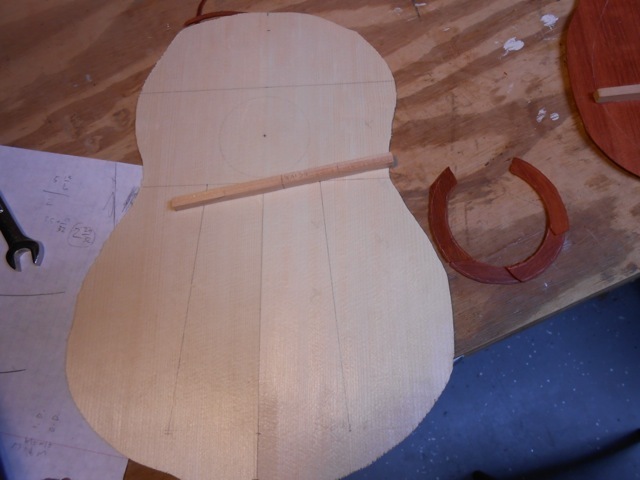 You carve them after gluing them down, because if you carve them first, the clamps slip off when you try to glue them. Thre is a semi-cylindrical arch sanded into the back braces (I think it’s a B-spline, technically) that, along with the neck-to-tail arch in the sides, gives a complex dome that’s not quite spherical to the completed back. 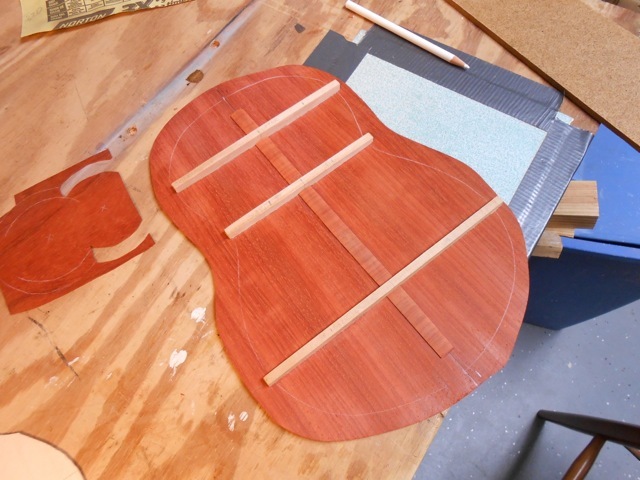 This helps reflect the sound out to the front of the instrument while stiffening the back, which allows it to be thinner, lighter and more responsive. But mainly because it looks good. Hey, if I had a motorized dish board, I’d use it, but I don’t. Top, thinned to 0.070″ on average, marked with brace locations. Playing with rosette designs. 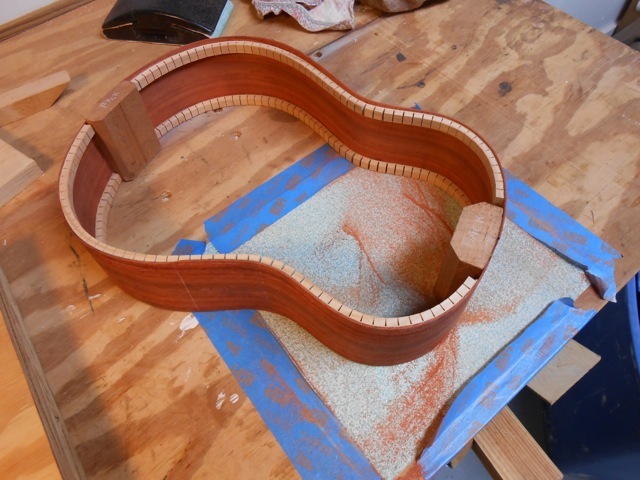 Going with a contemporary design here; that’s padauk from the piece that was going to be the top but it’s too thin. This entry was posted in Uncategorized and tagged Music by slumco. Bookmark the permalink.